Maximum stiffness and minimal weight in packable length for backcountry touring. Learn more. Compact, exceptionally light and ultra-stiff, the Striker 240 probe adds a new level of reliability to the touring gear of skiers, snowboarders and snowshoers in the backcountry. Unlike flimsy probes, its stronger, stiffer lower sections reduce deflection, offering greater accuracy and efficiency when probing in a strategic search. 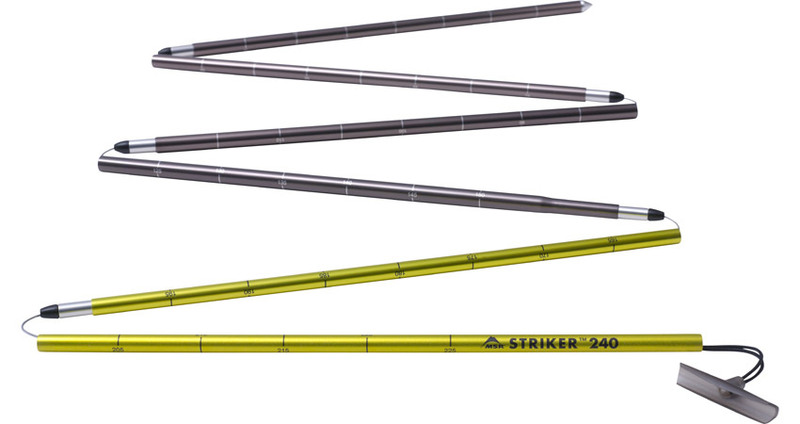 Combined with fast, reliable deployment, the Striker 240 refines this mandatory component of your safety kit. Compact: 240-cm length stows easily in a smaller day pack and is suitable for average snow packs. Fast Deployment: Single-pull design, quick-link ferrules and an instant-locking pin deploy probe fast when time matters.